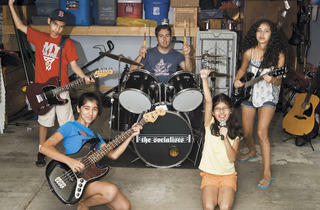 One dad’s love for Morrissey spawns the hippest family band in town. Photograph: Erica Gannett the Socialists: Fernando Rabiela with (left to right) Evan, 13, Sofia, 12, Cecilia, 10, and Anaiis, 14. Remember the first time you strapped on combat boots and dyed your hair a primary color, thoroughly confounding your parents? Even if tennis sweaters and Tretorns were more your speed, a few decades later, the punks, new wavers, grunge rockers and emo kids you knew in high school have likely toned it down, paired off and made babies. Though many have left their record collections and Manic Panic to an audience of basement dust bunnies, for some, the punk spirit lives on. Prime example: Morrissey-obsessed father of four Fernando Rabiela. He and high-school sweetheart Leila grew up crooning along to Morrissey’s band the Smiths. The couple make no secret of their ongoing love for the Mozer (a cool kids’ nickname for the British frontman)—posters and paraphernalia are tastefully arranged throughout their Garfield Ridge home on Chicago’s Southwest Side. Fernando even has a tattoo of Morrissey’s autograph on his forearm. So it’s no surprise the hip parents decided to take it a step further. In 2006, after beginning to learn guitar, bass, keyboards and drums by ear, five of the six Rabielas formed a band. 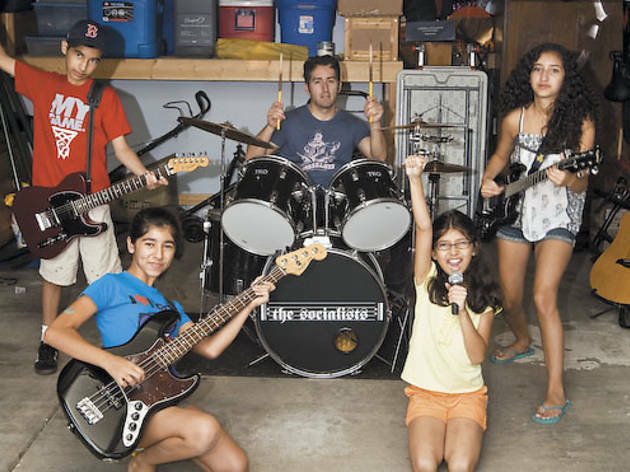 Anaiis, 14, Evan, 13, Sofia, 12, Cecilia, 10, and their proud papa are the Socialists—perhaps the youngest Morrissey cover band you’ll ever meet. And they’re good. Fernando and kids found they enjoy taking turns on all the instruments and vocals, which resulted in their band name. “We’re the Socialists because we’re all equal,” Sofia says. They’ve played more than 15 shows since their first performance at an aunt’s restaurant in Pilsen five years ago. Taking the stage at grown-up venues like the Empty Bottle (as well as events ranging from West Fest to Red Ribbon Week at the kids’ school), the quintet has developed an impressive set list. Beyond the Smiths songs, the Socialists also cover tracks by the Strokes and the Ramones. “Teenage Kicks” by the Undertones is Sofia and Cecilia’s favorite song in the rotation. While the kids mostly share their parents’ love for indie and punk, they do branch off. “My favorite artist is definitely Taylor Swift,” exclaims Anaiis. “I just saw her in concert— definitely the best show I’ve ever seen.” Evan, however, takes after dad, with Morrissey topping his list. Just don’t expect him to get inked any time soon—he’s too busy winning science fairs. Rock out with the Socialists November 19 at the Empty Bottle.